Important Torque Considerations for Large Diameter Tires. FAA-TSO C26d requires that brake assemblies have a demonstrated structural torque rating equal to 1.2 times the rolling radius of the tire multiplied by half of the gross weight of the aircraft — Torque = 1.2 x Tire Radius x MGTOW/2. FAA Required Torque = in-lbs. You can calculate the structural torque value for the bolts used to attach the torque plate to your gear strut in the following form. This assumes that you are using standard AN bolts. The standard bolt circle diameter is 2.25", but you may change this value if yours is different. Bolt Quantity: 0 1 2 3 4 5 6 Bolt Size: Select 1/4" 5/16" 3/8"
The diameter of the tire plays an important role in the ability of the brakes to hold the aircraft back at full static engine run-up as well as stopping power. Large diameter tires also put additional strain on the attachment of the brake assembly to the gear strut. 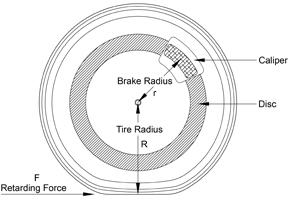 The relationship between the effective brake radius and the tire’s rolling radius can be seen in the diagram to the right. The moment about the axle of the brake must be equal to that of the tire which means that the retarding force on the tire (F) times the rolling radius of the tire (R) must be equal to the retarding force of the brake (f) times the effective brake radius (r). It is important to realize the importance of the ratio of the tire radius to that of the brake radius (R/r). The retarding force of the brake (f) is directly proportional to the rolling radius of the tire. If the rolling radius of the tire doubles, then there must be a corresponding doubling of the brake retarding force. This is an important consideration when installing large diameter tires. Another consideration is the strength of the attachment of the brake assembly to the gear strut. Because larger diameter tires impose a greated moment about the axle, there is also a greater torque load on the attachment of the brake assembly to the gear strut. In the forms to the right, you can calculate the structural torque caused by the tires and the attachment bolts necessary to carry this load. You should also consider the strength of the attach flange if any.